The long-drawn-out construction work of Badda U-loop under Hatirjheel integrated development project will be opened on Saturday. Prime Minister Sheikh Hasina is expected to inaugurate the U-loop on Saturday afternoon. 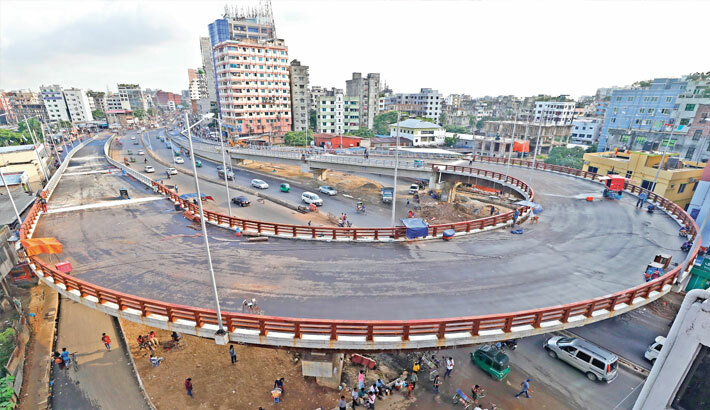 Talking to the daily sun, Project Director Jamal Akhter Bhuiyan said Badda u-loop will be opened for traffic movement from Saturday. “Once the project is complete, it will ease vehicular movement from Pragati Sarani, Aftab Nagar and Rampura towards Malibagh area,” he said. As part of the development project, there were plans to build two u-loops in Rampura and Badda areas to rid passengers of the scourge of traffic gridlock. The u-loop in Rampura was opened on June 25 last year, but the u-loop in Badda, the construction work of which began in 2015, is yet to open. Officials concerned said they hope the Badda u-loop will contribute largely to easing traffic congestion the way the Rampura u-loop did. When asked why the deadline for the project has been extended several times, the project director said the construction work had been delayed due to legal proceedings. Besides, there were some problems with other state-owned service providing agencies, he added. According to project officials, the Badda u-loop, which costs approximately Tk 40 crore to build, is 450 meters long and 10 meters wide. Once the Badda u-loop is inaugurated, the roads from Merul Badda to Kuril will be free from u-turn. Besides, vehicles bound for Rampura, Banasree or Aftabnagar can change their lanes easily. Bangladesh army’s 17 Engineering Construction Battalion is working to implement the project. Spectra Engineers Limited is in charge of the construction work.